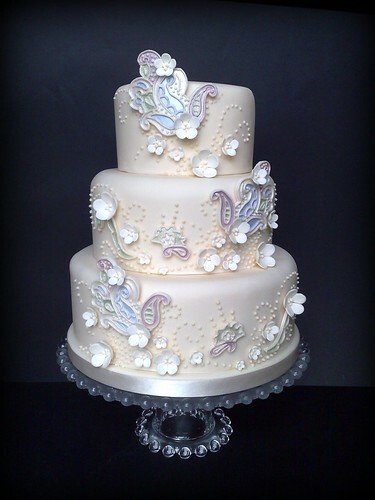 I have had this image for a Wedding Cake for ages....since doing the paisley cupcakes way back, I just LOVE paisley so much! I then found a cake designed by my favourite Cake Artist/Designer, Shinmin Li, (her work is out of this world) which was what I was sort of thinking, but with delicate flowers added for a more feminine feel (and alot more detail and skill I might add) so I can't take all the credit for the design. But I love this and feel it is a quite typical style of what I do. 3 tiered Dummy Cake covered in fondant with a hint of peach, decorated with blossoms and piping in the same colour and Paisley shapes handcut, dusted and piped.